Mon Oncle Antoine is like Citizen Kane of Canada. In numerous polls conducted over the years in this country, this film each and every time ranks as the greatest Canadian film ever made. The story of a rural and wintery Quebec mining town as seen through eyes of a young teenage boy, Antoine is deservedly revered internationally for it's poetic depiction of an aging and soon to be outmoded way of life, a timeless classic, John Ford-worthy elegance transplanted to a French-Canadian winter. We’re told it’s a long time ago but never exactly how long ago (it's actually the 1940's). Jutra dramatizes Benoit's journey like a grandfather telling a bed time story, recounting his youth through the filtered lens of nostalgia. 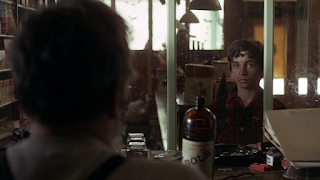 Young Benoit (Jacques Gagnon), 15, lives with his drunk and surly Uncle Antoine and his Aunt. He works at the general store owned by Aunt and Uncle helping to serve the miners who work extracting asbestos from the nearby quarry. Antoine also is the town undertaker, a job which has him moving bodies around by horse-powered sled. 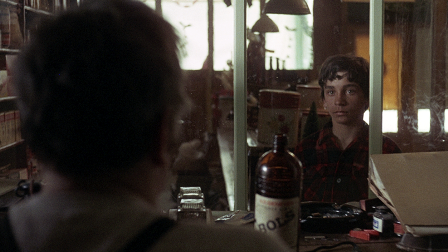 For most of the film we're observing the relationships of the townsfolk through the eyes of Benoit. The romance of these working class folks is surpringly sweet and tender and humour, their healthy libidos often cause them to find trysts in barns and attics on a whim. Benoit is thoroughly fascinating offering us the point of view of this bygone era. The young actor Jacques Gagnon has a remarkable face like Jean-Pierre Leaud in 400 Blows. He barely speaks instead we find emotion through his silent and stoic reactions to the events around him. The moment Benoit sees the corpse of the young Poulin child who has died is heartbreaking, and even more so as seen through the innocent eyes of Benoit. This terrific scene leads to the stunning and poignant third act journey home where we see the dramatic confession of Antoine and the completion of Benoit's rite of passage and ascendancy into adulthood. The final supremely emotional image of the boy watching the grieving family is as powerful as it gets in cinema. The asbestos mine looms over the town and thus the historical context of the movie. Health concerns are not mentioned, but knowing the dangers involved and likely the exploitation of the miners adds another level of sadness and melancholy. In fact, though it's not mentioned we can't help but wonder if the young boy's death was not influenced by the asbestos we see billowing into the sky from the quarry. Those who know their Canadian history will find links to the landmark labour strikes which would occur shortly after this time and the beginning of the 'Quiet Revolution' which provided the seeds for French separatist movement in the 60's. These levels are never referenced overtly, yet so profoundly affect us subliminally. The poetic and melancholy tone is remarkably affecting. The relationship of the characters to their environment, the omnipresent snow and wind which the characters seem to be guided by reminds us of Terrence Malick’s characters drifting through the wheat fields in Days of Heaven. Perhaps the best comparison would be another film from 1971, Peter Bogdanovich’s Last Picture Show, another Ford-influenced coming-of age-story from another era. Mon Oncle Antoine is as good as all of the above. Mon Oncle Antoine is available as one of the recent titles from the Criterion Collection, the ideal showcase for one of the greatest films ever made.